In Forrester’s evaluation of the emerging market for enterprise container platform (ECP) software suites, we identified the eight most significant providers in the category — Docker, IBM, Mesosphere, Pivotal, Platform9, Rancher Labs, Red Hat, and SUSE — and evaluated them. This report details our findings about how well each vendor scored against 10 criteria and where they stand in relation to each other. Enterprise architects can use this review to select the right partner for their enterprise container platform needs. 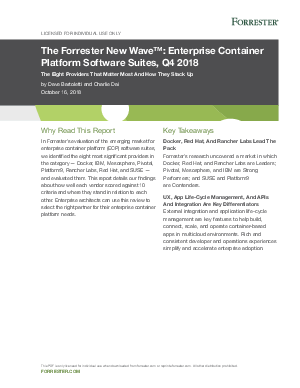 Forrester’s research uncovered a market in which Docker, Red Hat, and Rancher Labs are Leaders; Pivotal, Mesosphere, and IBM are Strong Performers; and SUSE and Platform9 are Contenders. External integration and application life-cycle management are key features to help build, connect, scale, and operate container-based apps in multicloud environments. Rich and consistent developer and operations experiences simplify and accelerate enterprise adoption.